The Palestinian Center for Development and Media Freedoms (MADA) has called for a formation of an independent commission of inquiry to investigate the killing of Yaser Murtaja, a 31 year-old photojournalist for Ain Media and the disproportionate use of excessive force by Israeli forces against journalists and civilians during the peaceful return demonstration along Gaza borders since “Land Day” 03/30/18. A colleague of Martyr Yasser Murtaja, Hussam Hashem Salem, a journalist for Ain Media, reported to MADA that, after demonstrators set fire to the tires on Friday 04/06/18, Yasser Murtaja was covering the scene from behind the demonstrators, and was standing about 350 meters away from the border fence where Israeli soldiers were deployed. He was wearing the standard protective vest and helmet. At this point, soldiers began firing live ammunition. One of the demonstrators was injured at the beginning, and then Yasser was targeted soon after, by one of the Israeli snipers, with an explosive bullet to the abdomen from the left side; the bullet penetrated his abdomen and left from the right side. He also added that Murtaja was transferred to Nasser hospital in Khan Younis, where he underwent a four-hour surgery in which part of his liver was removed. The bullet caused a severe rupture in his spleen and cut off some of the arteries, resulting in extreme blood loss; doctors had to provide him with 16 units. He was then transported to intensive care and, at midnight, his health deteriorated, forcing doctors to begin another surgery. Murtaja passed away after about an hour. On the same day, at least 6 journalists were injured: Khalil Abu Athra; who was targeted in Rafah, Adham Al hajjar, Izz Abu Shanab, Saber Nour Al Dein, Ibrahim Al Za’noun, and a female journalist named Islam Al Za’noun. All are photojournalists and were targeted in the eastern borders of the Gaza Strip. With the killing of Yasser Murtaja, MADA has documented a total number of 42 journalists killed by Israeli forces since the beginning of 2000, in the West Bank and Gaza Strip. Since the start of the peaceful return demonstrations in the Gaza Strip, ten days ago, at least 11 journalists were shot by Israeli soldiers, all of whom were targeted while covering from hundreds of meters away from the border fence where Israeli forces were located. All journalists were perfectly identifiable with their press vests. In light of the continuing and escalating crimes of the Israeli occupation against journalists and media outlets in Palestine, MADA Center reiterates its call on the international community in its various official institutions, to strive to establish an independent commission to investigate the crimes of the Israeli occupation against journalists and civilians in Palestine, and to put an end to the culture of impunity enjoyed by Israel, and to hold all perpetrators accountable. 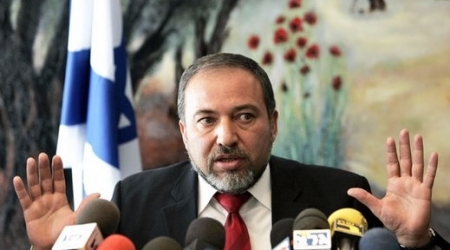 Israeli Defense Minister Avigdor Lieberman has asked Israeli Attorney-General Avichai Mandelblit to investigate rights group B’Tselem for asking Israeli soldiers not to kill Gaza protesters. B’Tselem hit back at Lieberman, stressing that live fire to disperse demonstrators is illegal under Israeli law. In a statement, the human rights group said that the order violates Section 110 of Israel’s penal code, and Lieberman’s efforts to have the group investigated are without merit. “The defense minister is the one inciting to break the law, and it’s good that the attorney general will now have the opportunity to officially determine this,” B’Tselem says, according to Days of Palestine. The Gaza Strip, run by Hamas movement, is a poverty-stricken and overcrowded Palestinian coastal enclave, a new report by Agence France-Presse (AFP) revealed. For more than a week the Gaza border with Israel has been the site of protests where Israeli occupation forces opened fire on March 30, killing 19 Palestinians and wounding hundreds. It was the bloodiest day in the enclave since a 2014 war, and since then 11 more Palestinians have been killed, including a journalist, by occupation forces while demonstrating for the right of return of Palestinian refugees along the border. Situated on the Mediterranean coast, between Israel and Egypt, Gaza is home to around 2 million Palestinians. They live in a cramped area of just 362sq.m, making it one of the most densely populated territories on the planet. After the Arab-Israeli war of 1948-1949 and the formation of the state of Israel, Gaza came under Egyptian administration, but was never annexed. Israel seized the territory from Egypt during the June 1967 War. On September 12, 2005, Israel pulled out all of its soldiers and settlers from Gaza in a unilateral move, which ended 38 years of occupation. In the summer of 2006, following the capture of an occupation force soldier by Hamas, Israel imposed a blockade on Gaza which was tightened a year later after the resistance group forcibly ousted troops loyal to Palestinian president Mahmoud Abbas’s Fateh faction. In 2013, the only entrance to Gaza not controlled by Israel, Rafah, was almost completely closed by Cairo. According to the World Bank, Gaza’s GDP losses caused by the Israeli blockade are estimated at more than 50 percent. The Gaza Strip has almost no industry, and it suffers from a chronic lack of water and fuel. Unemployment stands at 45 percent and more than two-thirds of the population depends on humanitarian aid. A reconciliation deal in October 2017 between Hamas and the Palestinian Authority generates tentative hope that conditions in the enclave will improve. But the discussions are at a standstill with both sides refusing to take responsibility for the failure. In January 2018, the UN Middle East peace envoy Nickolay Mladenov warned that the Gaza Strip was on the verge of “full collapse”. A meeting of donors in March greenlighted a project to build a desalination plant in Gaza. More than 95 percent of water in the enclave is unfit for drinking due to overpumping of groundwater. On February 27-March 3, 2008, Israel carried out operation “Hot Winter” following the death of an Israeli from rocket fire from Gaza. More than 120 Palestinians were killed. Unrest continued — Gaza rocket fire and Israeli attacks — in which hundreds of Palestinians were killed until a truce was concluded in June. On December 27, 2008 Israel launched a vast air offensive — “Operation Cast Lead” — in a bid to put an end to Hamas rocket fire. A ceasefire came into force on January 18, 2009 to end the Israeli operation, in which 1,400 Palestinians and only 13 Israelis were killed. Beginning November 14, 2012, Israel launched “Operation Pillar of Defence” with a missile strike that killed top Hamas commander Ahmed Jaabari. In the ensuing eight-day flare-up, 177 Palestinians and six Israelis were killed before an Egypt-brokered truce took effect. On July 8, 2014, Israel launched “Operation Protective Edge” against Gaza with the aim of ending rocket fire and destroying smuggling and tunnels dug from the enclave. The war left 2,251 dead on the Palestinian side and 74 on the Israeli side. On Saturday, 07 April 2018, Israeli forces killed photojournalist Yasser Murtaja. Murtaja succumbed to wounds he sustained after being hit with a live bullet that was shot by an Israeli sniper to the abdomen. Since the beginning of the incidents, 9 journalists sustained live bullets wounds. The Palestinian Center for Human Rights (PCHR) stresses that targeting journalists is a crime under the international law and the international humanitarian law. 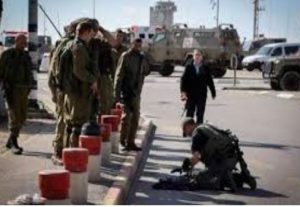 PCHR emphasizes that the Israeli forces practice the policy of silencing the press according to PCHR’s follow-up for decades. PCHR also condemns targeting journalists and peaceful demonstrators and confirms its persistent efforts to prosecute Israeli murders and war criminals. 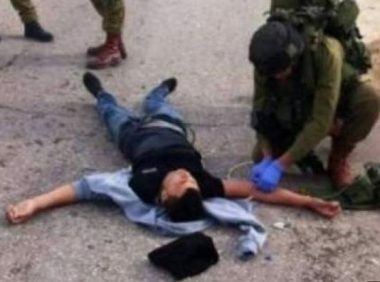 According to PCHR’s investigations, despite apparently wearing “a Blue Helmet and Vest clearly Marked Press”, at approximately 13:45 on Friday afternoon, journalist Yasser Murtaja was wounded after being hit with a live bullet to the abdomen causing a rupture to the main artery of the Intestines while he was recording the events, 150-200 meters into the northeast of the demonstration yard in Khuza’ah, east of Khan Yunis. Murtaja was transferred via an ambulance to Nasser Hospital in Khan Yunis. Doctors found out that Murtaja suffers from a sever bleeding in the abdomen in addition to a rupture in an artery. He underwent a surgery and received medical treatment until his death was announced at approximately 01:20 on Saturday dawn, 07 April 2018. · Ahmed Abdul Nasser Abdul Rahman Qafah (22),a photographer at New Scene Art Production Company from Deir al-Balah, was hit with a live bullet wound to the right foot, east of Khuza’ah on 30 March 2018. · Ahmed Salem Shehadah Barbakh (Mo’amer) (23), freelance photographer at an international agency, was hit with a live bullet to the pelvis, east of Khuza’ah village, on 30 March 2018, despite apparently wearing “a Blue Helmet and Vest clearly Marked Press”. · Mahmoud ‘Adnan Mdoukh, a journalist at Media Town Company, was hit with a live bullet that penetrated the leg, east of Gaza City, on 30 March 2018. · ‘Ali Yusuf Hamoudah al-‘Adawi (22), a photographer at Turkish Ikhlas News Agency, was hit with a live bullet to the knee, east of al-Buraij. · Wesam ‘Atef Salah Mousa (33), a photographer at the website of Forsan Al Eradah Radio Station, was hit with a live bullet to the feet, east of al-Buraij refugee camp, on 31 March 2018. 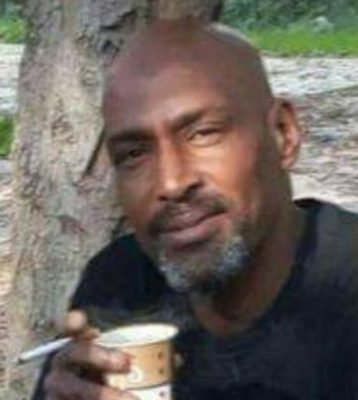 · ‘Ala’a Abdul Fattah al-Namlah (35) was hit with a live bullet to the lower limbs, east of Rafah, on 06 April 2018. · Khalil Ibrahim Abu ‘Athrah, a photographer at al-Aqsa TV Channel from Rafah, was hit with a live bullet to the leg, east of Rafah, on 06 April 2018. · Ibrahim ‘Emad Mohammed a-Za’anoun (21) was hit with a live bullet to the left hand, east of Jabalia, on 06 April 2018. 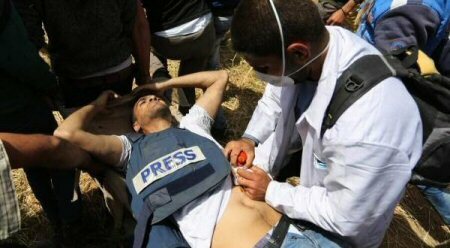 · Mahmoud Murtaja, a journalist at Palestine Press News Agency, was hit with a live bullet to the back, east of Gaza City, on 31 March. Targeting journalists, despite all the distinctive signs that emphasize the nature of their work and even the Israeli forces’ intentionally targeting the demonstrators in the upper side of their bodies undoubtedly confirms that the Israeli soldiers had orders or at least permits to cause casualties inflicted and deter journalists from covering these crimes as well. PCHR emphasizes that the rules of the international human rights law should be followed with peaceful assemblies on the Gaza Strip borders. Therefore, PCHR stresses that Israel should be obliged to the international standards relevant to the use of force and firearms by Law Enforcement Officials. Rules of firearm use stipulate that soldiers should not use live bullets unless their life is under imminent threat and the shooting must be gradual and proportionate with the threat. First, the soldiers shall give a warning and not in any case use live bullets, except as a last option to defend themselves or in cases of non imminent danger aiming at hindering the attacker’s movement and not killing him. According to PCHR’s follow-up and several international reports, the facts on the grounds confirms that no threat was posed to the soldiers’ lives as they were standing hundreds of meters away from the demonstrators and separated by three security fences and fortifications with a huge sand barrier and personal shields. This confirms the absence of any possibility of a real threat to the soldier’s lives. 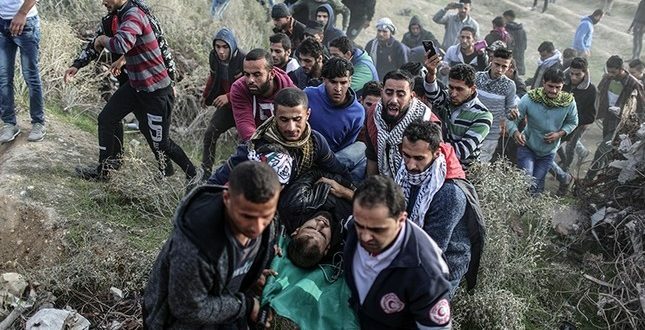 According to following up the targeting cases and injuries, one can confirm that the Israeli soldiers targeted the demonstrators with the aim of killing them. This can be clarified from the places of injuries; many of which were in the head and the upper parts of their bodies. PCHR condemns in the strongest terms the targeting of peaceful demonstrators and journalists by the Israeli forces, who deliberately caused casualties inflicted. The number of casualties inflicted amounted to 25 killed persons, including 3 children, and 1876 wounded persons, including 299 children and 57 women, within 8 days. Most of the wounded persons were hit with live bullets. PCHR calls upon the international community to take immediate action to stop the Israeli authorities’ crimes against the Palestinian people. PCHR stresses the central role played by the European Union (EU) in promoting the protection of human rights in the Middle East. Thus, PCHR calls upon the EU to activate the Euro-Israeli Association Agreement in order to ensure Israel’s respect for human rights in the oPt. PCHR affirms that the providing any military or political support by any international party in the meantime constitutes participation in the crime committed against Palestinian civilians.